Like utility patents, design patent validity can be challenged in inter partes review (“IPR”) proceedings. Nonetheless, the Patent Trial and Appeal Board (“PTAB” or the “Board”) tends to reach different results in design patent IPRs than in IPRs involving their utility cousins. Before June 2018, the PTAB had instituted design patent IPR proceedings at a much lower rate, around 40%, and only 4 of 14 challenged design patents had survived IPR scrutiny. 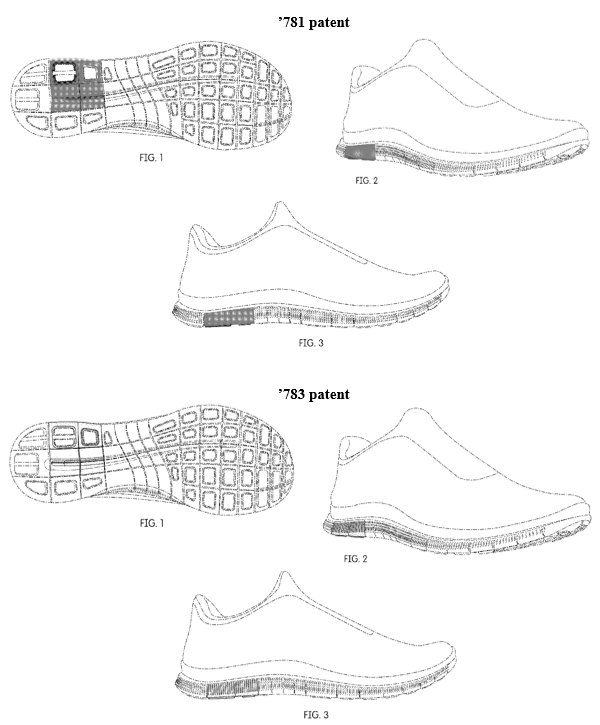 But on June 28, 2018, two more design patents survived AIA trials when the PTAB issued two post-trial decisions upholding the validity of two challenged Nike design patents covering partial shoe sole designs. 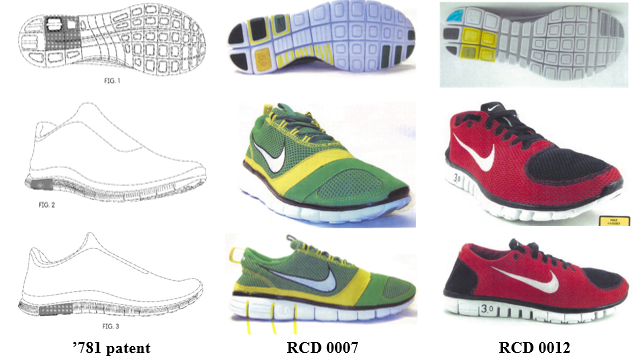 These design patents also are at issue in high-stakes competitor litigation in the Central District of California, No. 17-cv-8509 (C.D. Cal.). one or more of five secondary references (Registered Community Design No. 000725247-0012 (“RCD 0012”), China Design Registration No. CN 301711388 S (“CN1388”), Registered Community Design No. 001874165-0005 (“RCD0005”), U.S. Design Patent No. D447,853 S (“the ’853 patent”), and U.S. Design Patent No. D520,725 S (“the ’725 patent”)). At the institution stage, the PTAB found persuasive Petitioner’s claim that a designer of ordinary skill would have known to add the second sipe to increase flexibility. Patent Owner also argued that the prior art had to be substantially modified and rearranged to make “basically the same” visual impression as the challenged designs. 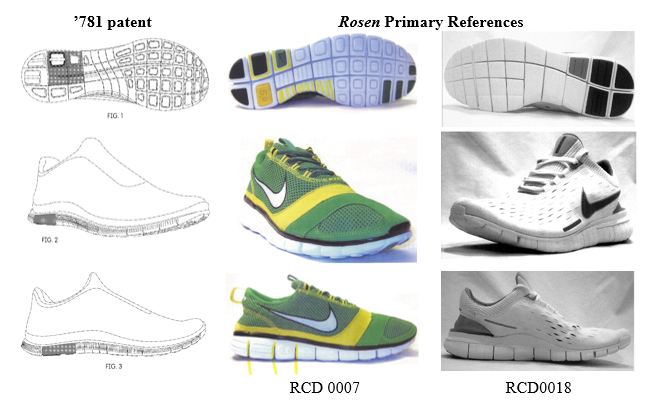 In its final written decisions, the Board held that neither of the two cited Rosen primary references had “basically the same” impression as the challenged designs. The missing “channel” element made all the difference. 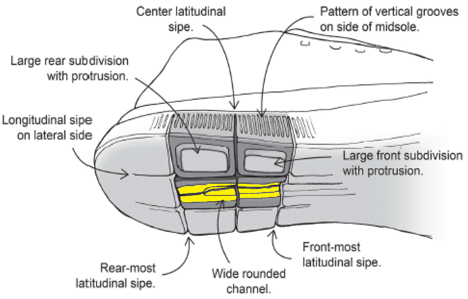 This element, “which is undeniably a feature” of the challenged designs, was not in the prior art and, therefore, no cited prior art created “basically the same visual impression” as the challenged designs. “Overall shape” can support institution, but winning requires attention to details. While the petitions merited institution due to overall similarity with the prior art, the challenged designs survived because they included a single, distinctive feature. Thus, these decisions show that overall similarity may be enough for institution, but prevailing on the merits requires attention to all material design details. Anyone considering whether to file an IPR petition for a design patent should take a hard look at the challenged designs and the prior art to determine whether the cited art includes all material details of the designs—not just that it has the same general shape and appearance. Potential victory in defeat? Now that the challenged designs have been construed to require the “channel” feature, the Patent Owner might be stuck with that interpretation in other litigation involving the challenged designs. The narrowed scope of these designs could impact infringement, particularly if the accused products lack such a feature. Perhaps the PTAB’s narrow construction, a tactical defeat in terms of invalidity, could serve a strategic purpose in parallel litigation for purposes of non-infringement. Skechers v. Nike., No. 2017-00621, Final Written Decision, at 11; Skechers v. Nike, No. 2017-00620, Final Written Decision, at 10-11. Skechers v. Nike., No. 2017-00621, Final Written Decision, at 23; Skechers v. Nike, No. 2017-00620, Final Written Decision, at 21. John is a trial lawyer having represented clients in many high-stakes and complex intellectual property matters throughout the country including Section 337 investigations in the U.S. International Trade Commission. He has represented clients in cases involving both utility and design patents, and has significant experience in litigation matters covering many fields, including pharmaceuticals, surgical implants, flash memory, computer peripherals, digital televisions, integrated circuits, and insurance, as well as vacuum cleaner, footwear, and lip balm design.